The SEO tool organizes your content into topics that matter to your customers. Each topic is composed of a pillar page and supporting content. Linking supporting content back to a pillar page on your main website helps search engines discover your content and surface it in search results. A topic is a main goal, problem, or idea that your customers are interested in. You can research and compare which topics are worth writing about directly in the SEO tool. Monthly Search Volume: the average monthly searches for this term in search engines. Longer or niche terms might have no or low monthly search volume, and broader terms might be highly popular but difficult to rank for. After creating a topic in the SEO tool, you can track Domain Authority for your topic phrase. This is a scale from 1-100 that determines how authoritative your domain is, and how likely you are to land on page one for that term in search engine results. A pillar page is a comprehensive resource page that covers a topic in depth. This page links to high-quality content for supporting subtopic keywords. A pillar page should apply on-page SEO best practices, referencing the topic in the page title, URL, and H1 tag. Content on a pillar page should also be adapted to convert visitors, since all your supporting content links back here. Want to see how other users are building their pillar pages? Check out a few examples on the HubSpot Marketing blog. Please note: the pillar page should sit on the top level of your website in a space that gets a lot of organic traffic. To ensure that everything on the page can be crawled by search engines, the pillar page should not have any content locked behind a form or a password. Subtopic keywords address a specific question about your pillar page topic. This piece of content should include a link back to your pillar page to drive traffic to your website. When you attach a blog post, landing page, or website page to a subtopic keyword, the SEO tool tracks how many inbound links you have referring back to your pillar page. 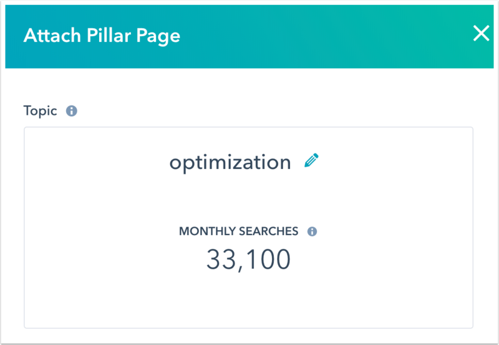 When you add a new subtopic keyword, you'll see analytics in the Subtopic Keyword panel for Monthly Search Volume. Please note: there is currently a limit of 20 subtopic keywords per topic. Additionally, each piece of subtopic keyword content, such as a blog post or landing page, can only be attached to one topic.